The formulas in the following examples return a sum of every second row in a range of cells. In the first example, the summing starts with the first row, whereas the summing in the second example starts with the second row. 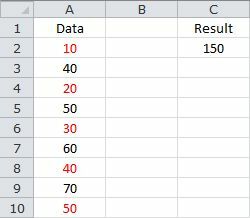 Based on the sample data, the formula returns 150. Based on the sample data, the formula returns 220.